When you get your new Windows 7 computer home or if you have upgraded to 7 you should go a head and make a Repair Disc, you will need one blank DVD in your DVD Drive. 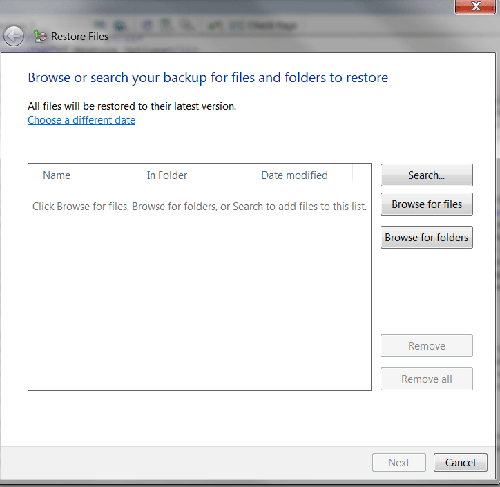 Then go to the Control Panel and click Backup and Restore, in the upper left corner click the link Create a system repair disc. You will get a popup Window, it should have selected your DVD drive, then click the Create disc button. That is it, after it is done label it and put it in a safe place. If you have a major crash you can use this disk to resolve the problem. You should do this right after you make your Repair Disc. You can use DVD's 7 to 8 of them or you could use a slave drive, or an External Hard Drive, I made my own External Hard Drive and used that. Then go to the Control Panel and choose Backup and Restore, in the upper left corner choose Create a system image. Choose where you want to store the image, one or more DVD's or Hard disk. You can use this image to restore your computer back to where it is when you make this image. It is best to make it right away before you add to many programs. This is a complete restoration, just like reformatting a drive and reinstalling Windows. When you click that link and the Window pops up there is another link, How do I restore my computer from a system image? open that and read on about how to use this image. I installed a bunch of software and my image was 32.07 gigs, that why I say make it right away and then start making regular Backups for the other data. After you have made your Repair disk and Image disk, make your first Backup, go to the same place and click the Backup up now button. 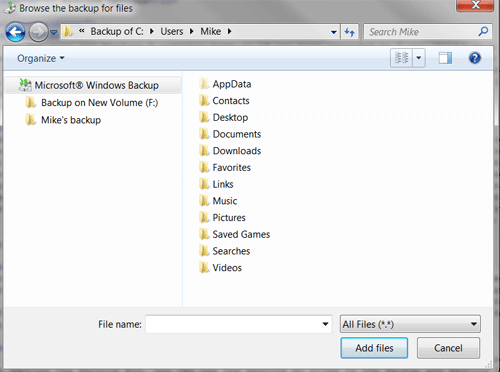 This will make a backup disk of all your files and data, if you have to use your image disk to restore your computer, then use your backup to install the rest of your files and data. This is going to take up a lot of space, it will save all your data and files and the neat thing with 7s backup you can restore individual files or folders, that is next. As you can see you can open the folders and see what is in them and choose what you would like to restore, pretty darn cool, Woot!! 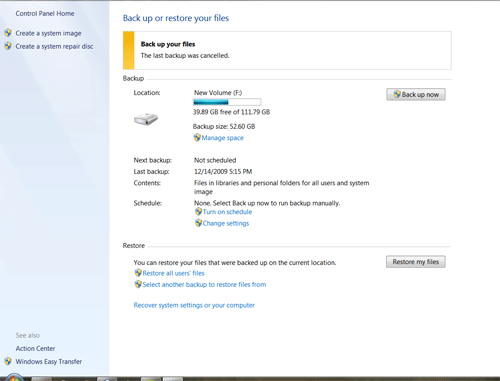 So they gave us a GREAT tool now we just need to be vigilant about keeping our Backups Up To Date. Now if your hard drive dies, you put in a new one, install your Image onto the new hard drive and then connect the computer to your Backup and transfer all your files and folders, back in business. And again if you mistakenly delete something and have kept your Backup current just open up the back up and restore the files or folder.